If girls like me, that's great...they all scream and it all goes mad, but that's a different type of me - that's the red carpet me...but the me that sits in a darkened room for eight hours a day watching the cricket with a big bowl of pasta in my socks and my underwear is not nearly so appealing to women. These words from Daniel Vettori…err..Daniel Radcliffe...put me in a Sherlock Holmesque conundrum. Had Harry Potter been a cricketer, what he would have been? A pie-chucker dishing out left or right arm filth? A mindless slogger? A soporific stonewaller? Or possibly an ICL rebel! When I came across the first Harry sketch, the scar on the face immediately caught my eyes. JK Rowling did manage to convince her gullible readers that some Lord Voldemort’s curse rebounded off Harry’s forehead, as if it was a carom board, resulting in the dent. But from cricketing point of, the scar was a tell-tale sign of someone whose suspect technique against the rising delivery has left a permanent tattoo on his forehead. Let's face the truth, Harry could have been in India's ODI middle order. Continuing with his batting, I have this sneaking suspicion that Harry was possibly more comfortable against the spinners. The magic broom suggests he was a natural sweeper and chances are there that he used the long handle to good effect too. Fancy Rowling's Harry Potter facing cricket's own Harry Potter Daniel Vettori. And it can’t be just a coincidence that Vettori and Radcliffe share their name! At the same time, considering that he has been doing all the running around on magic brooms, it would be difficult to vouch for his running between the wickets. In fact, I would rather be surprised if he is not actually in the mould of a say Inzamam-ul-Haq or a Sourav Ganguly. 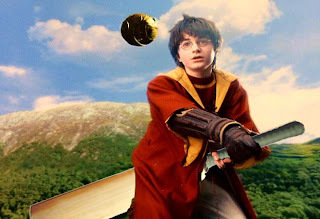 Evidence doesn't suggest much about his fielding but since he plays in the Seeker's position in the queer game of Quidditch, where his primary job is to search for the Snitch, Harry could be one of those fielders in the deep with a strong throwing arm. Similarly, lack of evidence blighted my view of Harry the bowler. But considering he doesn't come from the sub-continent, we can safely assume that he has not been reported for suspect bowling action so far. Potter's IPL team - Mumbai Indians, where the eveil Bhajji and he would have crossed swords. And his best friend, Shaun Pollock as Ron Weasley. But then who would be Hermione - Duminy in drag? It's complicated, almost like real life. really great ride...where you your imaginations flew more smoothly than potter with broom! NC, If Harry Potter remains in Bhajji's company for two days, he would be reduced to Hari Puttar. SP, I strongly resent the culture of gun propagated by you. Som, he will be reduced. Period. SP, I can very well see the cruel, curly smile on your face. NC, he indeed would be. som,this article is a jaffa mate..